Like most large cities (at least in Europe), London offers a great diversity of food from all around the world. One of the reasons is definitely a mix of people from all over the world living there. There are some parts of London that look like they belong to other countries. People dress according to their traditions back home. 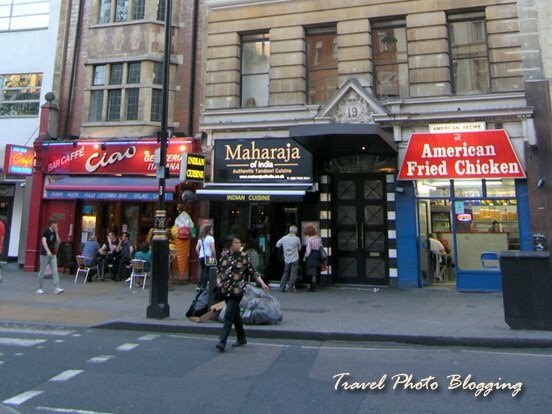 Also restaurants reflect this - in China Town you can obviously find all kinds of restaurants from the Far East. In some other parts of the city a different pattern is easily noticed. Half of the world's countries can have their food embassies (i.e. restaurants) lined-up side by side in a single street. In my opinion traditional English cuisine is not really something to brag about - at least compared to some other European alternatives. Nonetheless (or maybe exactly because of it) some of the best representatives of world's cuisines can be found in London. It is not always easy to pick out the really good ones, but it is worth giving it a try. I asked for some local advice and got a chance to taste some great stuff. All you can eat Chinese places in London China town are not really all that special. I tried my luck with one of them and I can't say anything good about the experience. On the other hand I got a recommendation for a sushi place in the same street which turned out to be really great. It is a simple Japanese restaurant with genuine and tasty food that comes in generous portions and is reasonably priced. For two persons I suggest you try a "Bento box" (sushi selection) and continue with a main dish each. You can expect to pay between £15 and £20 for the whole deal. The place is called Misato and you can find it on 11 Wardour Street. I suggest you avoid lunch time hours as it can get quite busy. Apart from that I even found a place where they serve really good traditional English breakfast, but that is a whole different story. For more information on that you will just have to wait for one of my next posts. Food used to be diabolical in English restaurants! I remember not wanting to eat out at all and then suddenly, on my trip back here in 2005, standards began to rise. A Full English Breakfast is one of my favourite things on earth and the reason I love coming back home! Great information. I didn't know England had a vast diversity of people there. You learn something every day. That's interesting. When I was in UK sometime around that time I also had a few not so great encounters with the famous English breakfast. It actually sucked... big time! Since this time I liked what I tried, I thought the choice of restaurants was to blame for this. However, what you say makes perfect sense.